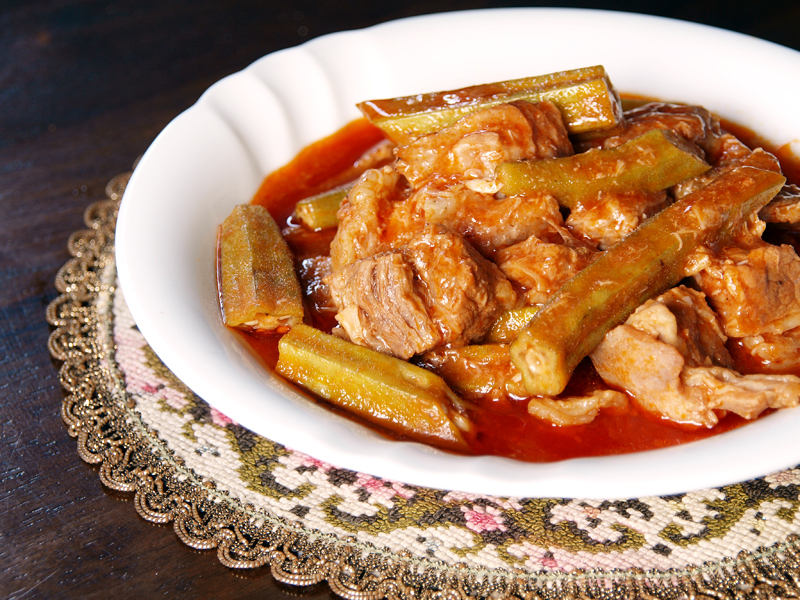 Bamia or Margat Bamia is an Iraqi stew made out of lamb or beef cubes, okra and tomato. This post is courtesy of my other half after knowing this dish from one of her colleagues; this is also the first time I will be posting an Iraqi dish as we don’t have any exposure on their cuisine. It is a really good dish and I am sure Filipinos and Spanish will appeciate this as the flavours are nearly similar to their stews, having said that I really love this dish and this will open a new type of cuisine in our home which means we will be starting to experiment on some of Iraq’s dishes and if you know of some good ones please post it on the comment below or send a link to your recipe. Soak okra in a mixture of 1 cup water and 1/2 cup vinegar for 30 minutes. Drain and rinse okra then set aside. In a pot add oil then brown beef on all sides. Remove form pot then set aside. Add onions, garlic, cumin, coriander, cinnamon then sauté until fragrant. Add the beef back together with tomatoes, tomato paste, beef stock, Bring it to a boil and simmer in low heat for 1 hour or until meat is tender. Add water if needed if stew becomes dry. In a pan, add oil then sauté okra for 5 minutes. Add okra back to the stew pot together with lemon juice and simmer for 15 more minutes. Turn heat of then serve with white rice. This looks unique – okra and beef, never would have imagined. Iraqi cuisine is not so popular even though the country is really well known by everyone! its a pity. Mmmm, beef and okra stew – this sounds so comforting. Not a big fan of lamb but I would use beef and of course okra is my favorite. This looks good, Raymund! Oh this all looks amazing to me. I’ve never tried an Iraqi recipe either–this is very cool! Okra is a popular veggie in my part of the world, and this would be a fun way to use it. I like the unusual mixture of spices involved. Mmm I love okra and the seasonings look good- perhaps I could make a tofu version? Now I know where to come when we pick Iraq!!! Sounds delicious–and yes, Iraqi cuisine is underrepresented elsewhere in the world. Thanks for introducing it here, Raymund! Interesting dish, but brisket, tomatoes and okra does sound good.